Despite some allegations such as indentations and a rubber residue left by some unrecommended car seat protectors, the odds are in favor of installing a good car seat protector. The distractive gloom of naysayers about car seat protectors may make you lose the big picture. Which are the best three of these protectors? 2. 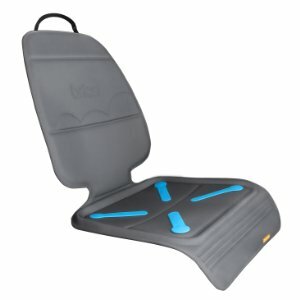 Munchkin Auto Seat Protector -Excellent structure with stabilizing wedges. 3. Summer Infant Duo Mat Crash tested and durable vinyl texture. Brica is currently the best selling car seat protector in the market. Brica is a super quality product that guarantees your child’s safety through its advanced non-slip technology. The protector is made of non-bleaching fabric which guarantees that it will never bleed onto the car seat upholstery. Its grime resistant and waterproof fabric makes it an easy to wash car seat cover. The fabric is also very sturdy and thus it does not compress, which ensures that the seat belt or latch does not generate slack. It is also made with dual grip non-slip technology on both the front and reverse sides to ensure that no movement occurs on either side. Unique design ensures compatibility with all types of car seats so that you can use it throughout your child's growth stages. Provides excellent coverage for both front-facing and rear-facing car seats. Its major shortcoming is a relatively higher price, but it is a worthy investment considering the high quality and long lasting material that will see it through throughout your child’s growth. Munchkin Auto has made an excellent yet affordable car seat protector and its quality justifies its second best selling position. It features a stabilizing wedge that keeps the protector firmly secured in place, coupled with a sturdy and textured surface that ensures there no risky slipping. Munchkin auto seat protector therefore guarantees your child’s safety while on the move and with all kinds of car seats. Its sturdy material serves the dual purpose of preventing indentations to your car’s backseat. 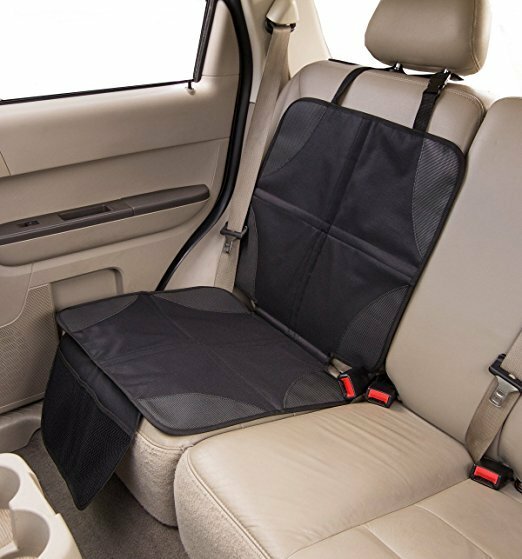 Its waterproof and color-safe material covers your backseat against spills and crumbs while leaving the seat fabric spotless. It is also easy to clean. Features expandable front storage pockets to hold baby things such as bottles, snacks, toys and even a car escape tool. It also features anchors for the car seat latch, thus increasing its rigidness in motion. You cannot assure absolute safety of your child in the car and you may want to monitor him or her with a mirror. If your car has no backseat headrest where to strap the reflector, click to view our review of the best baby car mirror for car with no headrest. Designed based on the input and feedback of loyal parents, your car will thank Zozho for their latest and best in town auto seat cover. Innovation- Zozho offers the most comprehensive package of car seat cover features available anywhere. Its raised edges christened ‘spill catchers’ are quick to install and they easily cover all parts reachable by the child’s spills, scratches, stains, crumbs and even muddy feet. It is also double padded with a high density foam panel to prevent indentation from the pressure of the baby car seat in rocking motion. 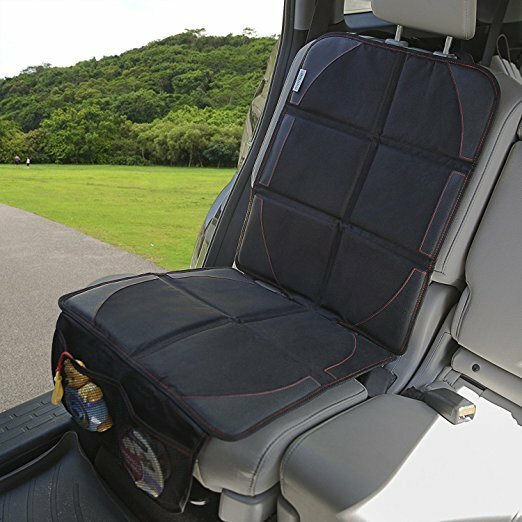 (i) It features extra-long adjustable strap clips that secure it firmly to the headrest thus ensuring that the auto seat shield snuggly fits and prevents it from sliding whether it is in a small car, SUV, truck or minivan. (ii) A security pad flap goes between the child seat and the back seat for further anchoring. (iii) Double sided non-slip grips prevent any kind of slippage. Another good thing is that the backing is universally adaptable to all cars. A double layered fabric provides resistance to wear and tear. Your car seat protector should not only serve to protect your vehicle upholstery; it should hold up to abuse and pressure for the long haul. Ease of use- if you are like most parents who always have a busy day, then ability to get your baby ready in a jiffy is always a welcome relief. Zohzo is fast to install and uninstall and it fits all kinds of auto seats and child booster seats. Front storage pockets provide awesome space to tuck bottles, diapers, toys, out of your child’s reach. This is also an excellent product and a top selling cool car seat cover rated 4.5 out 5 by hundreds of customers. A front cover and a high back cover works well with front facing and rear facing baby car seats, respectively. Vinyl texture on the front and wedge anchorage and non-skid fabric on the back holds the protector firmly in place and prevents skidding at all speeds. The product has been crash tested to assure this. 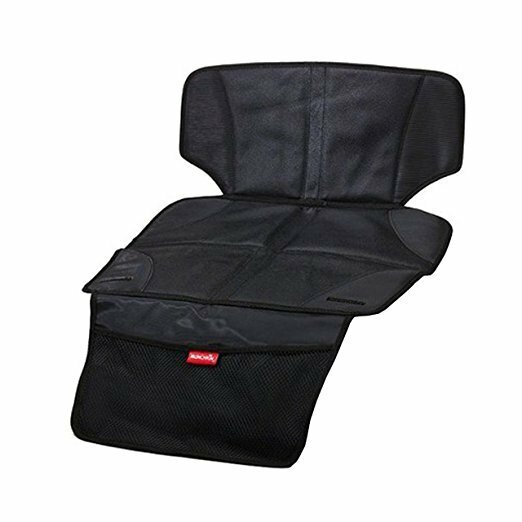 The seat protector is made of waterproof plastic material resulting in a so easy to clean car seat protector. You only need to spot clean. The material is durable and thus once you find the best car seat to grow with baby, this protector will match the one time purchase as it can be used throughout the child’s growth. It also has deep side slots to accommodate the latches and seat belt. Rated 4.9 out of 5 by customers, Lusso Gear is a premium quality car seat protector that is all about style, function, and durability, giving an excellent value for money. Premium quality 600D polyester fabric with leather reinforced corners and anti-slip dot coatings ensures the car seat will never shift in all conditions. Its reinforced padding results in a material that is not too thick to generate slack and not too thin to compromise protection of the backseat against indentation and scuffs-the sweet spot! It has headrest straps that hold the high back part in position. By design, the base is extra wide in order to catch all the crumbs, drooling and spills your kid or pet may spew around. 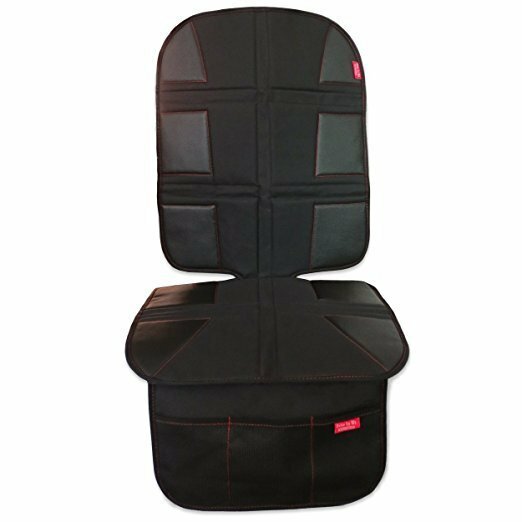 Again, 3 deep storage pockets carry more baby items while serving a dual role of kicks protection to the front of the car seat. It also has a universal design and is convertible to fit all types of car seats and all types of vehicles. 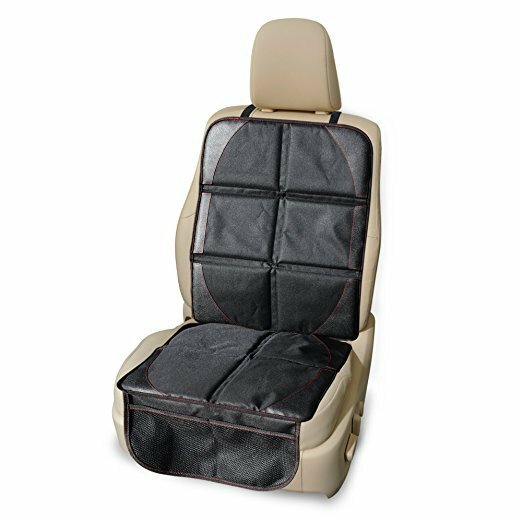 Besides fabric, it is a perfect car seat protector for leather seats. Noteworthy, you would have to fork a few more bucks to have it but the quality is worth it. Royal Oxford luxury car seat protector is a high-end luxury car seat mat and its quality does not betray this fact. It is also one of the oldest and most ingenious car seat mats under car seats. The best material for car seat covers-Handmade premium 900D Oxford fabric and waterproof leather ensures no spillage percolates. Advanced anti-slip PVC spots keep the mat tightly secured in place resulting in a non-slip guarantee. Besides, the 2017 upgrade is extra-large and multiple layers of pad to suit all types of cars, trucks, and SUVs. The design is also optimized to suit all types of child car seats. The protector material is optimized for babies, pets as well as adults (for example after morning workout). Its pricing is premium and it requires regular leather polish, implying some cost in its maintenance. However, my take is that the superior handmade quality is worth the extra cost. Britax car seat protector is a highly sought-after seat accessory and its best in class engineering is worth the mention. It is made of a sturdy rubber material that guarantees a long life while preventing seat indentation. The material is also as compact as it can possibly be, ensuring that the seat belt will never generate any slack. Specialized engineering has been done to its non-slip cladding on the underside that ensures the car seat does not shift whether it is an emergency stop or crash. The edges are raised to trap all debris and spills. Again, the material is waterproof thus making cleaning to be effortless. The price is comparatively higher but the high demand shows that customers are finding its quality worth it. Parents love this elegant and top rated car seat covers from Freddie and Sabbie due to its simplicity-easy to install, easy to clean, while maintaining high standards of quality and reliability. It features a super-grip non-slip cladding and a headrest strap that hold the protector firmly in position throughout the journey. It is made of handmade heavy duty super quality materials that are non-toxic and PVC, giving a long-lasting and eco-friendly car seat protector. 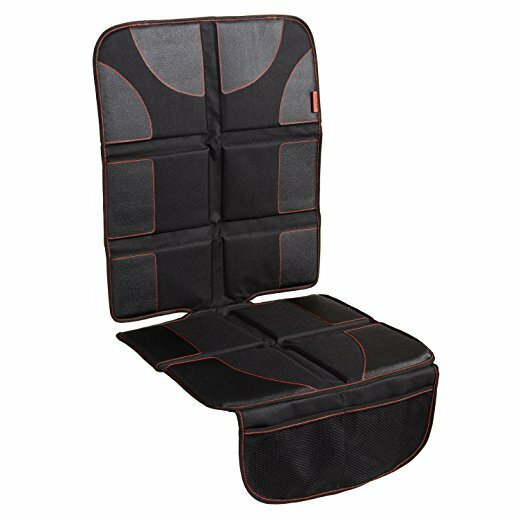 Wide and deep front storage pockets provide more storage space compared to other car seat protectors. Cheekie Monkie’s super seat saver mat has awesome features that guarantee to maintain your car upholstery in perfect condition, whether leather or cloth while lasting over the long haul. All types of baby car seats can use this mat and it's made of durable material. It features extra-strength non-slip reinforcement and sturdy foam padding that absolutely prevents slipping. It is also designed to cover the back of the seat, the bottom and the front from spills, stains and scratch marks. Its universal design fits all kinds of car seats, truck seats, or SUV. Consequently, its universality can justify its slightly higher price compared to seat protectors of equally good quality. Designed by experts who are parents themselves, this car seat saver from PoppyTootToot has been designed with an obsession for your child’s safety and your need for neatness and organization in the car. The car seat protector is wide enough and adjustable to fully fit the car seat. Coupled with a high quality and waterproof fabric, PoppyTootToot protects your seat's entire length from indentations, dust, stains, and crumbs thus saving you expensive washing. It has super grip vinyl pads that hold the infant car seat rigidly in place and prevents slipping in all situations. It is also compatible with and is one of the best car seat mats for leather car seats. The car seat protector bottom is generously wide and can fit even ultra large baby car seats. It also has a flap that tucks into the baby car seat holding the two firmly in place. Ponder this; your child get the Styrofoam packed milkshake, jumps into his booster car seat, along the way he starts his tantrums and you look back to find that he has torn the edge of the cup and the shake is spurting out all over him and his seat. You can do some cleaning but later on you definitely have to take the seat out and wash it. How do you like it? This is where the importance of the toddler car seat protector comes into good use. The shake would just have pooled on the car seat saver mat and saved you the hassle of washing the car seat. ​(i) Shields your car seat from dirt and spills-For most toddlers, boarding the car is quite a scene. They make a mess of themselves and the car interior, climbing, hopping on the backseat before they get in their baby car seat. Besides, there are those who will advise you to make sure that the child does not eat anything in the car but that is simply hogwash. Who has ever managed to control a child’s eating schedule? The point is, a child will always demand snacks, sippy cups or any other grabs while on the move. Within no time the car interior will be cruddy and littered. With a waterproof seat cover to go under car seat, very little cleaning would be needed. ​(ii) Preventing damage to the backseat-there is lots of damage to the back seat when a car seat protector is not used. First, the baby car seat exerts undue pressure on the back seat, leaving permanent indentation and scratch marks. Secondly, when the car is in motion, there is continuous rubbing between the baby cars seat base and the vehicle seat, which gradually wears out the back seat leather or fabric. Lastly, the crumbs and other stuff the kid strews are mashed into the back seat fabric by the shifting child car seat and the result is certainly disgusting. (iii) Guards the car seat from baby kicks-Some seat covers also feature back of the front seat protector, to guard against the kicks of the child’s restless feet, for kids on front facing and booster car seats. If your child is at the age where he/she is using the rear facing car seats, make sure the car seat protector mat is long enough to cover the back seat against his or her kicks. On a lighter note, this is more common with boys and thus finding something that will suit a baby car seat stroller combo can be a great saving. (iv) Easy to wash - most of the car seat protectors are waterproof making their washing hassle free. For non-staining dirt or mud, you may just spot clean the spill proof car seat cover and you are good to go, whereas if it is something more serious like juice spill or getting soiled, gentle hand washing will return it to its previous spotless condition. By design, majority of the seat covers for under car seats are in dark colors to minimize discernible stain. ​(v) Non-slip Feature-Unlike towels, most car seat covers feature non-slip straps and sturdy non slip material that can hold them tightly in position and prevent the baby seat from shifting in case of an impact. Consequently, some of the auto seat covers are textured on the underside to increase the grip on the vehicle upholstery. After all, it's grievous to have something that will loosen in case of a crash. ​(vi) Organizing Baby Items-Some best seat protectors for car seats feature pockets thus enabling you to keep baby things at close range and organized. The pockets can be at the sides or front, within reach or out of reach of the child, so you should take that into consideration when choosing your car seat protector. There can also be one or multiple pockets. How do you about the car seat protector installation? 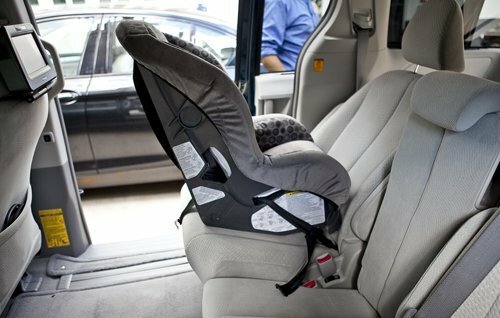 The different seat savers for car seats have differences in compatibility and different installation procedures. It is therefore important to first confirm with the car manufacturer whether the car seat protector of your choice suits your car seat. There are general guidelines though: first, you should ensure that installation does not necessitate adjustment of the car seat. If it does, then this is a safety risk (risk of shifting when the car is in motion) and the seat saver should be returned to the seller. Or else, try fitting it with a different car seat or a different car altogether. 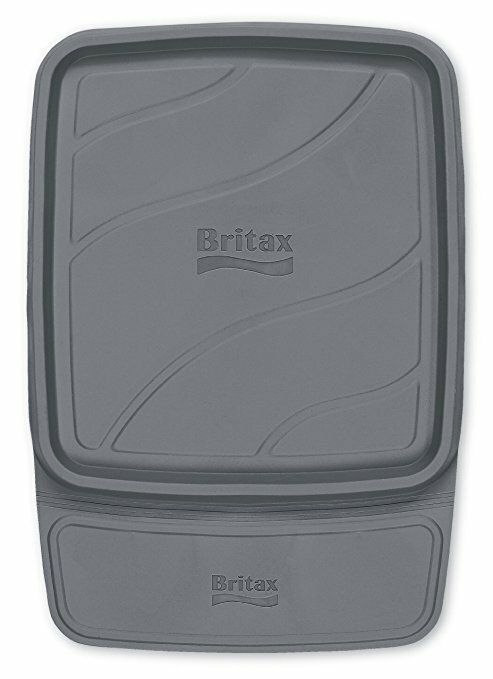 Some car seats protectors can be used with most car seats but a majority of them such a Britax are custom made baby car seat covers. A major issue connected with this is latch compatibility. The pad for under car seat should not lead the seat belt to generate slack during movement or in a crash. First, install the baby car seat best rated for your car seat mat and lock the car seat belt or latch tightly in place. Next, mark the seat belt or latch position with a marker, loosen it and remove the car seat protector. Finally, re-position the baby car seat without the car seat cover and reattach the seat belt and latch at the marked position. If the car seat movement is too free (more than an inch), then that car seat mat is not the correct match. In general, each car seat protector comes with a manual and the instructions should guide you on the product-specific installation procedure. In connection to the above, concerns have been raised regarding safety with the under car seat protector. However, our verdict is that safety should be a concern with incompatible and untested car seat protectors. We only research and recommend compatible, non-slip and crash tested car seat mats. This is what you should look out for when purchasing a car seat cover and should always confirm from the manual and the manufacturer. Again by following the installation instructions visited above, rest assured that you have done it right. With more and more brands of seat protectors for under child seats entering the market by the day, it can be daunting a task trying to find the best car seat cover. Even though we have done an exhaustive review above, we can't simply rest on our laurels and let's, therefore, share the factors that you should look out for. 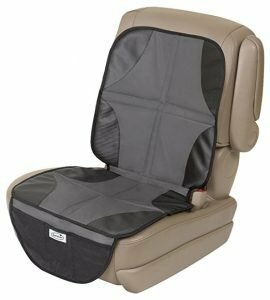 ​(i) Quality/durability- the hallmark of any car seat protector review is quality. You are a buying the protector to protect your seat against damage, wear and tear, indentations, stains and so on, protect your child or pet by securing the car seat firmly in position, whilst lasting over the long haul (at least 5 years). The car seat cover should therefore be able to do exactly that. 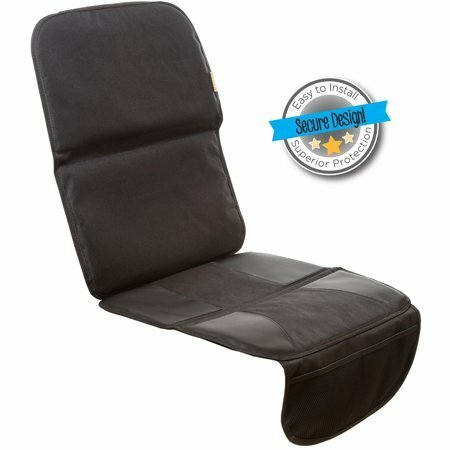 In order to meet these expectations, the seat protector material needs to be heavy duty sturdy, waterproof and color safe, along with proper safety features. The best materials for seat covers worth mentioning here are leather, vinyl, rubber and neoprene. ​(ii) Safety- safety on the road is nonbargainable, especially when it comes to children. The car seat mat should be able to hold the car seat in position without generating slack in all kinds of car motions, such as acceleration/deceleration, turn off, overtaking, emergency braking, car crash and so on. It also needs to have high-quality non-slip cladding, pads or spots, head straps and latch anchors that all ensure everything stays as taut as it can best be. Above all, confirm that the car seat protector has been crash tested by the manufacturer. (iii) Design compatibility and dimensions- car seat protectors are coming in different designs; some are universally compatible while others are car specific. However, whatever car seat liner you choose, it is advisable to try it out and check whether it matches your car seat and also confirm its compatibility details from the product manual or the manufacturer. These features include covering the entire car seat, enough anchors for the car seat belt and latch, optimal thickness that won’t generate slack while ensuring durability. (iv) Aesthetics- you spend a lot to spruce up your car’s interior and therefore the car seat protector needn’t come to reverse this gain. Luckily so, they are now in different shades of whatever color you might choose, as well as creative designs. Overall, we recommend choosing a dark color if your car seat is light and vice versa. (v) Negligible maintenance requirement- you also spend quite a pretty sum on maintenance of the car items and so if you can have an accessory that won’t create additional maintenance costs, the better. To achieve this, the car seat pad material should be waterproof, stain free and color safe to make it easy to clean, essentially only requiring spot cleaning most of the times. 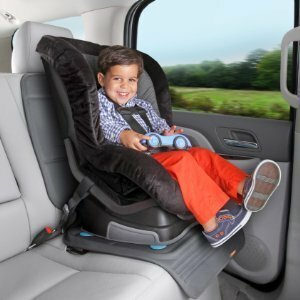 (vi) Online reviews-unless it’s a new product release, almost all car seat protectors will have customer reviews on various forums or e-commerce sites where they leave feedback. You should therefore check for the reviews’ average rating, comments and the number of reviews. The reviewers are people who have had first-hand experience with the product and even though by nature some people tend to overlook either a positive or negative attribute, the average rating is a good indicator of what you should expect with the product. 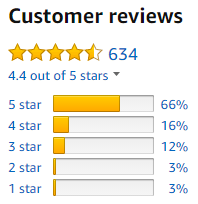 Most people also don’t bother to leave feedback, and therefore, a relatively higher number of reviewers might imply that the product is popular, especially if the average rating is high. (vii) Cost- all the effort to review the car seat protector checklist adds up to naught if the product you end up with exceeds your budget. Luckily, there are good car seat protectors across various price segments and you should reiterate until you have something that matches your pocket. Motoring Essentials Guide participates in the Amazon Services LLC Associates Program, an affiliate advertising program designed to provide means for sites to earn advertising fees by advertising and linking to Amazon.com. Additionally, Motoring Essentials Guide participates in several other affiliate programs, and we sometimes get a commission through purchases made through our links.